Have you had to resort to people knocking on your front door instead of using the doorbell? The broken doorbell that you’ve meaning to fix for months now? Believe it or not, a doorbell that needs fixing is pretty common. In the past, doorbells used buzzers or single bells to alert homeowners. Today, many “doorbells” are digital, with wireless doorbells becoming used more and more in newer homes. This article focuses on how to fix an “analog” doorbell not working from the most recent era; the doorbell chimes. As homes that were equipped with this type of doorbell age, so do the parts of their functional system. Many factors are involved when a doorbell is broken. Fortunately, though, each of the possible causes of a doorbell not working can be checked pretty quickly and easily. This helps you narrow down the problem so that you know what to clean, repair or replace. Below are some common problems for doorbells that need to be repaired. Keep in mind, that if all else fails, or you don’t want to spend the time on a doorbell repair project you can purchase a wireless doorbell system for relatively cheap. If you press the doorbell button and nothing happens, the first thing to check is the fuse or a tripped circuit breaker. If you verified the fuse/breaker is ok, then the issue is in the button itself, the bell or chimes, the doorbell transformer, or the wiring. Check the button first as this is usually outside, exposed to the elements. Anything is possible with the button to cause a doorbell to stop working. Unscrew the button from the wall and make sure that you see two wires touching. You may have to pry off the cover plate to get access. Don’t worry, you don’t need to cut the power to inspect these wires. Reconnect any loose wiring to their terminal screws. If this doesn’t solve the problem, disconnect the wires and touch them together, holding them by their insulation (plastic part). If you hear a ring, then the button has become defective. See if you can straighten and clean the terminals and contacts where this wires connect to. Use sand paper or an emery board. If after you reconnect the wires, the button doesn’t produce a ding-dong sound, then you’ll need to replace the doorbell button completely. If your button is fine, remember, the problem could also be the in the bell or chime box. Remove the cover to the doorbell and do a thorough cleaning of all the parts inside. Use a Q-tip with rubbing alcohol if you see any grease and dirt. Make sure to clean the chimes, hammer and contacts. Be sure there are no loose parts or wiring inside as well. You’ll be surprised at how a good cleaning and tightening of things in there can fix a doorbell! If the doorbell still doesn’t ring, then you’ll need to check the doorbell transformer. As above, make sure all wires are tight at the transformer. If you have a multi-meter or volt meter, test the terminal screws for voltage. If there is none, then you’ll need to replace the doorbell transformer. You can also test it by touching the terminals together with a small wire (it’s low voltage, so don’t worry about shock – there will be a tiny, non-harmful spark at the most). You should see this small spark as you lift the wire off. If the transformer is fine, and the doorbell is still quiet, then you may need to check all the visible doorbell wiring you can in the house. Or, simply invest in a new, wireless doorbell system (see below). Ask yourself if this might be easier than to fix my doorbell. As mentioned above, many homes in the recent past have doorbell chimes, where a striker hits a high-pitch tone when a button is pressed, then a low-pitch tone as the button is let go. To check why the chimes aren’t ringing, remove the chime cover and ensure all parts appear clean and connections are secure. If all looks good, try getting a reading from your volt meter by touching prongs on the terminal marked “Front” and one on the screw marked “Trans”. You can also test this by placing a small wire on these two terminals. The wire should cause the chime to trigger. If not, it’s time to replace the doorbell system. If the doorbell you’re trying to fix only has one “ding” when the button is pressed and let go, check to see if anything is sticking. The most common problem is in the button outside or inside the chime cover with the strikers. Clean and lubricate any parts that aren’t moving fluidly. Use powdered graphite as oil will only attract dirt and cause worse problems for you! You may have other symptoms with a doorbell not working, such as a faint ring, inconsistent performance, ringing constantly. You can usually address these doorbell fixes by following some of the techniques mentioned above. For example, check the button for loose wiring, sticking parts or dirt and grease. Most doorbell repairs can be accomplished just by tightening down parts or cleaning connections. A doorbell that goes off constantly most likely means there are some wires touching. This is relatively easy to check. As mentioned above, sometimes it’s easier to buy and install a new wireless doorbell. Obviously, there are no wires and no fooling around with transformers or electricity. You do normally have to use batteries, but just keep a supply on hand when replacement time comes. 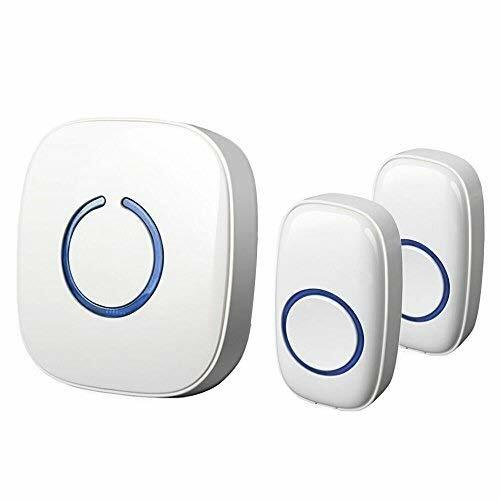 What’s great about this kind of wireless doorbell, is that you get added features such as the ability to add multiple buttons, choose different ring sounds, and even connect security components such as a motion detector alert or door opening alert sound. For all that, plus the convenience of wireless installation, these things are not a bad price at all. Check them out at Amazon. Remember, the solutions above on how to fix a doorbell can help you if nothing major is broken. And if you need to replace parts, you might as well save yourself the headache and replace the doorbell or buzzer with a new wireless doorbell.